Waterworld is a 1995 science fiction set a few hundred years in the future at a time when the polar ice caps have melted and the land areas of the world have been submerged under the oceans, a modern version of Noah’s Flood. The film stars Kevin Kostner. When Director Reynolds quit, Kostner took on the job of directing the film. I enjoyed this film because for the most part I was able to suspend disbelief in the science. Not everyone was able to do that. Kevin Carr was not impressed by the liberties taken with the science. Could the Earth Become a Waterworld? My thesis here is that Earth is already a waterworld. The National Oceanic and Atmospheric Administration (NOAA) has confirmed what Kevin Carr said and points out that, “The timeline for this event is rather vague: “probably more than 5,000 years, some scientists say”. NOAA: If All Ice Melted See the tab: About the Science. Based on the volumes of land ice, the United States Geological Survey (USGS) estimated the potential sea level rise as 80 meters (about 260 feet). In my opinion, the estimate by the USGS is more reliable than that given by National Geographic. USGS: How would sea level change if glaciers melted? Waterworld opens to show a revolving globe with rising sea level. The link I provide below shows the entire Continental US being submerged, including the Appalachian Mountains. The clip stops at the title scene to avoid infringing copyright. New York City is entirely submerged under the ocean and Costner has to dive deep into the sea to reach street level. So where is the Empire State Building? The real Empire State Building stands on a site 15 meters above sea level, thus an 80 meter rise in sea level would reach 65 meters above ground level. The building has 102 floors from the ground to the roof and is 380 meters tall. That means Costner should have been able to enter a window on the 17th floor. Sackets Harbor, near Oswego, New York, is located at the eastern end of Lake Ontario at an elevation of 87 meters. According to the USGS, there is enough water locked up in the ice to raise the world ocean almost to that level and no higher. However, the elevation of Oswego is low enough that it did not prevent the construction and opening in 1825 of the Erie Canal. The canal passes near Oswego on the way to Buffalo. The elevation of river water level at Albany 1 meter above sea level and the elevation of Buffalo is 183 meters. Buffalo is about the same elevation as the middle floor of the Empire State Building, the 51st floor. In his blog, Anthony Watts, a meteorologist, used the National Geographic estimate of sea level rise. Here I will continue to use the USGS estimate of 80 meters. Watts estimated the height of the site of the Statue of Liberty at about 3 meters. So where would the waterline be if sea level were to rise 77 meters above ground level? Watts gives measurements from the National Parks Service: ground level to the tip of the torch is 93 meters. The waterline would be 16 meters below the tip of the torch, a little below the level of Liberty’s chin. (This is because a new ice age would again lock up sea water in ice caps. In the last 2.5 million years there have been about 50 periods with advancing glaciers, most recently at intervals of about 100,000 years. Following the assumption that all polar ice could melt and using 80 meters instead of 65 meters, I estimate the time to melting of the ice caps at about 30,000 years. If sea level rises twice as fast in the future, that would give about 15,000 years. So whatever assumptions we use, the timeline for melting of the polar icecaps is over 10,000 years. NOAA and Watts agree that the issue is the timeline. Watts makes the additional point that the long-term threat may be the advancing continental glaciers, not sea level rise. The film was not a box-office success in America but international sales and spin-offs probably allowed the studio to break even. However, I don’t pay attention to box-office success and have seen the film twice. I would watch the film again for the scenery and the action and a few laughs about other science goofs, which I won’t mention in case I spoil the film for some readers who may decide to view it. I conclude that no matter how absurd a proposition may be, it can be turned into a learning experience. Waterworld Part 2 will examine the figure of the Earth as a water planet. Part 2 will take a different approach than Wikipedia. Here I compare, without comment, the maximum-month rainfall in a SE Asian country and the annual average of the PDO Index. The Climatic Research Unit (CRU) was established in the School of Environmental Sciences (ENV) at the University of East Anglia (UEA) in Norwich in 1972. The CRU has collected, collated and archived global climate data for over 40 years. In 1987, the American Meteorological Society published a paper by Stanley Grotch of the Lawrence Livermore National Laboratory, University of California, that assessed the robustness of the CRU dataset for land and other datasets. Three data bases of gridded surface temperature anomalies were used to assess the sensitivity of the average estimated Northern Hemisphere (NH) temperature anomaly to: 1) extreme gridpoint values and 2) zonal band contributions. Over the last 100 year, removal of either the top or bottom 10% of the gridpoint anomalies in any year changes the estimated NH average anomaly by 0.1−0.2°C. Excising extensive zonal bands also produces root-mean-square changes in the estimated NH anomaly of approximately 0.1°C. The estimated NH average anomaly appears to be robust to such perturbations. Grotch cited the paper by Jones that described the land and ocean datasets: A new compilation of monthly mean surface air temperature for the Northern Hemisphere for 1851-1984 is presented based on land-based meteorological station data and fixed-position weather ship data. PDF: JONES, P. D., et al. Northern Hemisphere surface air temperature variations: 1851-1984. Journal of Climate and Applied Meteorology, 1986, 25.2: 161-179. Grotch’s paper claimed that the land (CRU) and ocean (COADS) datasets pass his tests of normality and freedom from bias. His presentation is reasonable. However, his Figure 1 shows 26,000 data points for thee Nothern Hemisphere (NH) that range between plus and minus 2 degrees Celsius . By contrast, the signal (the mean temperature) ranges from approximately -0.2 C to +0.2 C over a period of 130 years, a rate of about 0.3 C per century. The question arises: What is the standard error of the estimate? How much confidence can be placed in the vertical location of a point on the black line when the data range is ten times greater than the signal range? We do not know. The NH temperature increase from 1885 to 1940 was about 1.0 C, about double the increase over the period 1851-1984. The biggest change in temperature was before 1950, when CO2 began to be emitted at modern levels.This rise in temperature by 1 degree C cannot have been man-made climate change, but merely a natural fluctuation in temperature. The lowest average temperature in the NH was around 1875. The periods 1875-80 to 1935-40 and 1935-40 to 1995-2000 are both 60 years, approximately the same as the period of the Atlantic Multidecadal Oscillation (AMO). However, we do not know how much of the temperature change on land observed during the last 120 years was a natural response to oceanic oscillations, including the AMO. Since no warming was observed between 1940 and 1980 and since little or no warming has been observed since about 1995-2000 (apart from El Ninos), the 15-year period from about 1980 to 1995 is our strongest, and perhaps only, evidence for a long-term trend towards global warming. But if the warming from 1980 to 1995 was related to the warm phase of the AMO, then we can expect, first a peaking in the cycle, and then a gradual downturn in the AMO, which may have already occurred but has been masked by El Nino events. The air temperature data recorded at sea (COADS) from the period 1850-1980 revealed no global temperature trend. Grotch did not elaborate on the weaknesses of the COADS air temperature dataset, but the situation is clear from his paper. The temperature of the sea itself is not shown. Until the Argo system began to be deployed in 2000, oceanographers had to rely on ships at sea to measure the temperature of the world ocean. The ocean covers 70% of the Earth’s surface and the thermocline extends to a depth of about two kilometers. Thus, most of the heat in the biosphere is stored in and released from the ocean. Nevertheless, the CRU did produce annual estimates of global average temperature using a combination of land and the sea-surface temperature (SST). At the time Grotch prepared his paper world use of fossil fuels was also known. It would have been possible to raise the issue raised by Klyashtorin and Lyubushin in their paper On the coherence between dynamics of the world fuel consumption and global temperature anomaly. The graph compares fossil fuel use worldwide over about 140 years including those covered by Grotch’s paper. As I recall from the paper the correlation coefficient between fossil fuel use and global temperature change was given by r = 0.3. The coefficient of determination (r-squared) was about 0.09. This indicates that variance in fossil-fuel use accounted for 9% of the variance in global average temperature. On this flimsy evidence, in 1992 a vast world-wide initiative was started with the aim of regulating the temperature of the Earth. United Nations Framework Convention on Climate Change. Global Warming, Lysenkoism _ Eugenics Prof Richard Lindzen, at 30:37. The start date of the satellite record is 1979. It appears that Antarctic temperature peaked around before 1982 and has declined slightly since then. Satellite temperature is actually a measure of the level of radiative energy of the atmosphere. The anomalies show the changes in the level of energy at the measured wavelengths. As a consequence, the integral of the changes may indicate the direction of change. The integral of temperature may not have an obvious physical meaning apart from the vibration energy of the molecules in the atmosphere. However, in some years higher temperature indicates that energy is being added to the oceans while in other year energy is being lost. The integral of of temperature is a proxy for the running total of net energy lost and gained that indicates the direction of change more clearly than does the temperature. Kulusuk Lake is located on Kulusuk Island off the east coast of Greenland about the same latitude as northern Iceland. The lake was the subject of a recent paper. The authors present a graph that shows the relative rates of change in the glacier in terms of advance and retreat since 10,000 years ago. From about 8,000 to 4,000 years ago (during the Holocene Climate Optimum) it was too warm for a glacier to form. After about 4,000 years ago, a glacier formed and began a series of advances and retreats up to the present as shown in their graph. I plotted their graph and then wondered what it would look like if I accumulated the advances and subtracted the retreats. The figures are relative and not absolute. Thus the resulting curve shown below does not tell us the total mass of the glacier at any point but merely indicates how the glacier grew in mass from 4000 years ago (2000 BC) to its greatest extent around 1200 years ago (800 AD), then began to lose mass until the Medieval Warm Period around 1000 years BP. After 1000 years BP the glacier gained mass during the Little Ice Age, which ended around 200 years ago. Since then the Earth’s climate has been getting warmer and the glacier has retreated again. Still the glacier seems to have a long way to go before reaching its extent at the end of the Roman Warming Period around 1500 years ago. 1.Declines in the curve correspond to increasing total ice mass and thus cooling. 2. It can be seen that the shape of the curve for the 2000-year period from 4000 BP (before the present) to 2000 BP is similar to the shape of the curve for the 2000-year period from 2000 BP until the present. The correlation coefficient is 0.78 and R-squared is 0.60 with 21 pairs of data, significant at the 1% level of confidence. A possible explanation is given by Nicola Scafetta. 3. The glacier gained mass after 4000 years before the present (BP) and then lost it by 38oo BP, a date that corresponds to the Minoan Warm Period. The glacier then gained mass until about 3200 BP a time that corresponds to the end of Mycenaean civilization. 4. The glacier then lost mass during the period 1200 BP to 1500 BP, a period that corresponds to the Roman Warm Period. 5. The glacier gained mass for 300 years after 500 AD (1500 BP) during which Roman civilization declined. 6. From around 700-800 AD (1200 BP) to 1000 AD (1000 BP) the glacier lost mass due to warming. This would correspond to the Medieval Warm Period in Europe. 7. During the period from 1500 BP to 1000 BP the general increase in mass of the glacier was reversed by a significant glacier retreat around 1300 BP, before retreating to its furthest point around 1000 BP. This indicated that cooling was not uniform between 1500 and 1000 BP, but broken by a warm interval around 700-800 AD. 8. After 1000 AD the glacier gained mass during the period known as the Little Ice Age, a gain that was reversed by warming after about 1800 AD. 9. Since 1800 AD (200 BP) the glacier has recovered mass lost since the year 1000 AD but has not yet recovered the mass lost since 700-800 AD (1350 BP). It is not certain to what extent changes in glacier mass are driven by changes in temperature or changes in precipitation. Wind blowing over a glacier can cause sublimation of ice directly to vapour without an intervening liquid stage. The mount Kilimanjaro Glacier is known to respond to wind in this way. Whether or not the Kulusuk Glacier has responded this way is apparently not known. If so, the mass of the glacier would be less than expected from melting caused by temperature change. Therefore this attempt at correlation between the mass changes of a Greenland glacier and European climate is merely suggestive. Nevertheless, the analysis is consistent with that of H. H. Lamb. As for the Greenland settlements about 1000 AD, it seems that Greenland may have recovered from the very severe climate conditions that prevailed 200 years before settlement began in 985 (1030 BP) and by around 1000 AD appeared suitable for settlement. The settlers could not have known that climate would deteriorate for hundreds of years during the Little Ice Age, just as we do not know if climate will again deteriorate and the glaciers again advance. 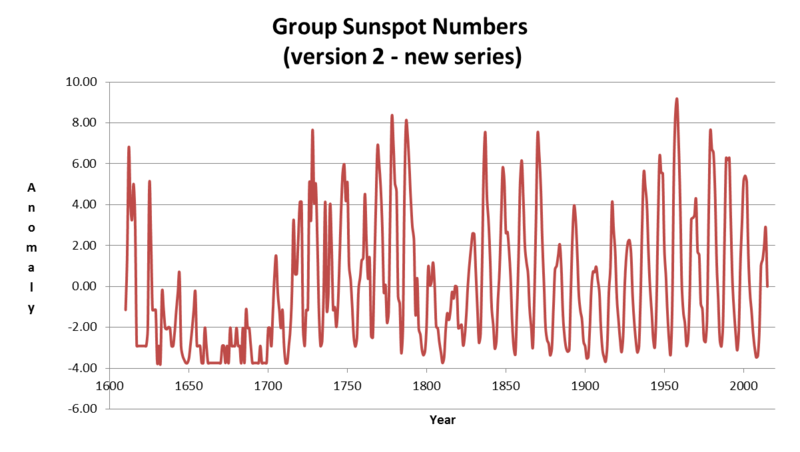 In Part 1, sunspot numbers observed from 1750 to 2015 were used to display both the 11-year cycle and the century-long Gleissberg Cycle. As before, the data source is WDC-SILSO, Royal Observatory of Belgium, Brussels. The data is version 2, the new series. The mean value of 3.78 has been subtracted from each data point in order to show the anomalies (departures from the mean (average). The plot shows the anomalies, not the absolute values. The Maunder Minimum is the period during the 16th century when few observations exceeded the mean. The Dalton Minimum is a similar period of shorter duration from the end of the 18th to early 19th century. Not so obvious is a period centered around 1910 when sunspots were less numerous than usual. I accumulated the data series by adding the second value to the first value to get the value for the second data point. To get the third data point, I added the third value to the second data point. The new series will increase as the Group Number increases and will decline as the Group Number declines. 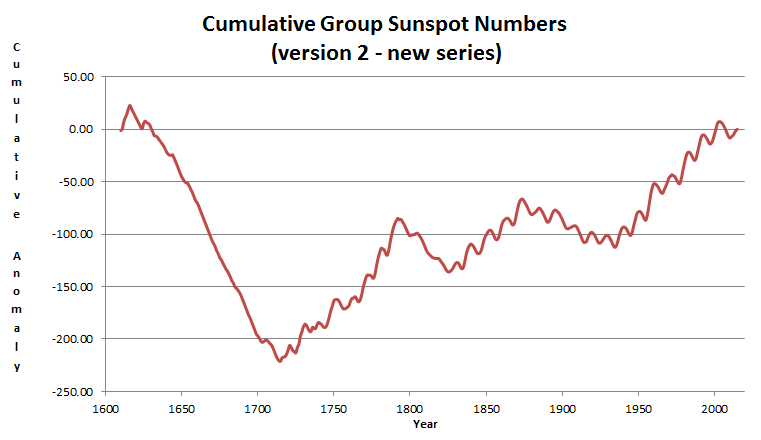 The graphic displays a metric for CUMULATIVE number of sunspot groups. From the start date, the cumulative total increases and then declines until the Maunder Minimum. The cumulative value then rises during the 18th century and then declines until the Dalton Minimum, rises during the first half of the 19th century and then declines until around 1940 and then rises until the end of the 20th century. I do not see a centennial-scale cycle here. The first cycle seems closer to 200 years, which would make it a Suess cycle (or de Vries cycle). Which is why I think of the Gleissberg and Suess/de Vries Cycle as pseudo-cycles. The lack of regularity can mean either that the phenomenon is chaotic (like turbulence) or that other factors are operating, such as changes in gravity acting upon the Sun caused by the orbital motions of the planets. I interpret the long sunspot cycles as indications of increases and decreases of the amount of energy entering the oceans and the ice caps of the Earth. The reason is that the atmosphere and uppermost few meters (yards) of land can store very little energy. I mention “ice” because when ice melts it absorbs a lot of energy as latent heat. So during the upward swing of the Gleissberg Cycle I expect an increase in solar energy entering the oceans in the tropics and melting ice at or near the poles. The controversial aspect is the claim that changes in solar activity have a significant impact on the climate of the Earth. This question I leave until later in the series. The model presented here shows a proxy (substitute) for solar activity. There are other proxies for solar activity that can be used alone or as “predictors” for sunspots. These I will discuss in Part 3 of this series. First I ask the question, “Are counts of sunspot groups consistent with counts of sunspot numbers?” The reason I ask this question is that Group Number (GN) and the Sunspot Number (SSN) are two related but different proxies for solar activity. What is the Gleissberg Cycle? The Gleissberg cycle of solar activity spans roughly 80 to 90 years. Because it is not regular, it is probably better described as quasi-periodic or as a pseudo-cycle. You can easily discover it for yourself. I entered the monthly data into a spreadsheet and plotted it. The 11-year cycle is apparent but the Gleissberg Cycle is not. To display the Gleissberg Cycle, I standardized the values as described below and then cumulated the standardized values. In the following graph, the 11-year cycles appear in clusters of increasing or decreasing numbers of sunspots. A full cycle up and down is defined as a Gleissberg Cycle after Wolfgang Gleissberg. Z-score = (DATA-AVERAGE) / STDEV. The key to the graph is this: After calculating Z-scores I cumulated the scores by recording the first Z-score by itself. Then for the second data point, I added the second Z-scores and so on. At some points the up scores added to the down scores should cancel and the line values should be zero (the line should cross the X-axis). This method is very crude because the vertical position and the location of the high and low points depends on the starting value. The starting point itself is arbitrary, determined by the point in time when the observers started recording carefully enough and regularly enough for today’s scientists to report sunspot numbers instead of groups of sunspot numbers. One way to improve would be to add 100 years or so of data going back to the Maunder Minimum, a period of 650 years from 1645 to 1715 when few sunspots were observed. Because the Maunder Minimum was such a long period with few sunspots the graph would start around zero and a starting point near zero would be roughly correct according to our best current knowledge. The 11-year solar cycles can be seen, usually 4 to 7 one after the other increasing and decreasing. The peaks occurred around 1790, 1880, and 2005, 90 and 125 years apart. The troughs are 105 years apart. The average of these intervals (90, 125 and 105) is 107 years, rather longer than the usual value cited of 87 or 88 years. The cause of the Gleissberg Cycle is speculative. Possibly the process is chaotic, resulting from changes in magnetism deep in the Sun that cause turbulence at the surface. The chaotic nature of the cycle may result from two dynamos within the Sun that are interacting. The Gleissberg Cycle may be displaying the beat frequency of these two dynamos. Alternatively, the gravitational pull of the planets may affect the Sun’s activity. Next I will try to improve the graphic by adding more data. SILSO provides annual data back to the 17th century. To analyze the graphic we should keep in mind that it displays a metric for CUMULATIVE number of sunspots. I interpret this as long-term (century) increases and decreases of the amount of energy entering the oceans and the ice caps of the Earth. The reason is that the atmosphere and uppermost few meters (yards) of land can store very little energy. I mention “ice” because when ice melts it absorbs a lot of energy as latent heat. So during the upward swing of the Gleissberg Cycle I expect a lot of solar energy entering the oceans in the tropics and a lot of melting ice at or near the poles. Ocean currents tend to distribute energy from tropical to polar regions. So I would expect to see ice melting in the Arctic Ocean. I would expect to see less ice melting in the Antarctic. Why? First, the southern oceans are bigger and so the heat is distributed less densely. Second, the existing ice is more extensive than in the Arctic and therefore the Antarctic ice reflects more light back into space preventing it from converting into heat energy. In effect, the 100-year length of the Gleissberg Cycles is not long enough to have much impact on the Antarctic ice cap. Further, ice in the Antarctic is mostly land-based and is therefore less affected by ocean heating. By contrast, ice at the margins that is not grounded on the seafloor would be subject to increased melting. These theoretical predictions are confirmed by observations. Finally, I conclude that even if one solar cycle of 11-years does not greatly affect climate, a series of 5 sunspot cycles either up or down may be expected to have a cumulative effect. What makes it so difficult to determine the effect is the fact that ocean currents must be integrally involved because only the oceans can store solar energy for 50 years and then release it. The oceans therefore act as a low-pass filter for variability in solar output. There is an interesting paper by Nir Shaviv, Using the Oceans as a Calorimeter to Quantify the Solar Radiative Forcing. He estimated that the variation in ocean temperature within one solar cycle is about 0.1 degree Celsius. We can see from inspection of the Gleissberg Cycle graphic that from 1935 to 2005 the time span is about 70 years compared to 7 solar cycles, giving a duration of 10 years per cycle. The vertical span of the upward swing is 7 bars, and each cycle averages one vertical bar. If each cycle from top to bottom represents 0.1 degree Celsius, that would give a span of 0.7 degrees Celsius between 1935 and 2005. This may be compared with the rise in ocean heat content estimated to have raised the temperature by about 0.8 degrees Celsius per decade, 056 degrees C in 70 years (1935-2005). This rough comparison suggests that from 1935 to 2005 the Earth’s oceans should have heated by 0.7 degrees Celsius from excess solar energy alone, whereas the oceans heated only 0.56 degrees Celsius. This analysis seems to be flawed because that would be too great a rise in temperature. The variation in one 11-year cycle may overlap the variation in the next. Assuming only 50% of the figure estimated by Dr Shaviv (o.o5 degrees Celsius) the heating from solar variation over 7 cycles would be 0.35, 60% of total observed oceanic heating. This analysis suggests that the percentage of total heating by increased solar activity between 1935 and 2005 was between 60% and 100%. OR Sunspots are not so tightly correlated with the Sun’s energy flux as hitherto believed. Still the Gleissberg Cycle is important because at least some approaches to analyzing Sunspots cycles suggest that solar energy accumulates over many cycles sufficient to affect global warming. This is a highly controversial subject that I leave until later in this series. Part 2 will attempt to extend the analysis back to 1610. This will correct some of the bias at the beginning of the series because the zero point on the graph will coincide with a time when there were few sunspots observed.